Chipotle Mexican Grill Restaurant (Florissant) will host will host a fundraiser for Marygrove on Tuesday, August 28. On that day, Chipotle will donate 33% of qualifying purchases made between 5:00 p.m. and 9:00 p.m. to Marygrove. All you have to do is show a copy of the flyer below, or just tell the cashier you want to support the cause. 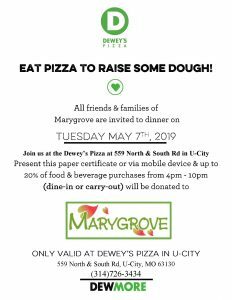 What a great (and delicious) way to support our mission!